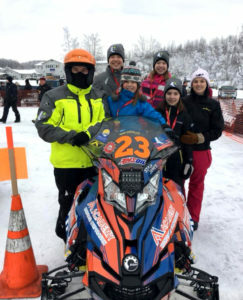 Iron Dog Team 23 Update: Alaska Foot & Ankle Specialists congratulate Team 23 for successfully completing the rugged 2,000 plus mile Iron Dog snowmobile race in Fairbanks, AK. Team 23 riders, Stan James and Paul Sindorf crossed the finish line on Saturday, February 24th, checking in at 14:04:26. The Iron Dog snowmobile race has earned its title as the world’s longest and toughest snowmobile race. Team 23 traveled over 2,000+ miles through rugged terrain, fierce weather, unforgiving wilderness and extreme subzero temperatures. Alaska Foot & Ankle Specialists are proud to sponsor Team 23 in the 2018 Iron Dog Race. Riders, Stan James and Paul Sindorf competed in the pro classification. Both James and Sindorf rode Ski-Doo MXZ X-RS 600 snowmobiles. Cheers Stan and Paul from all of us at AFAS!